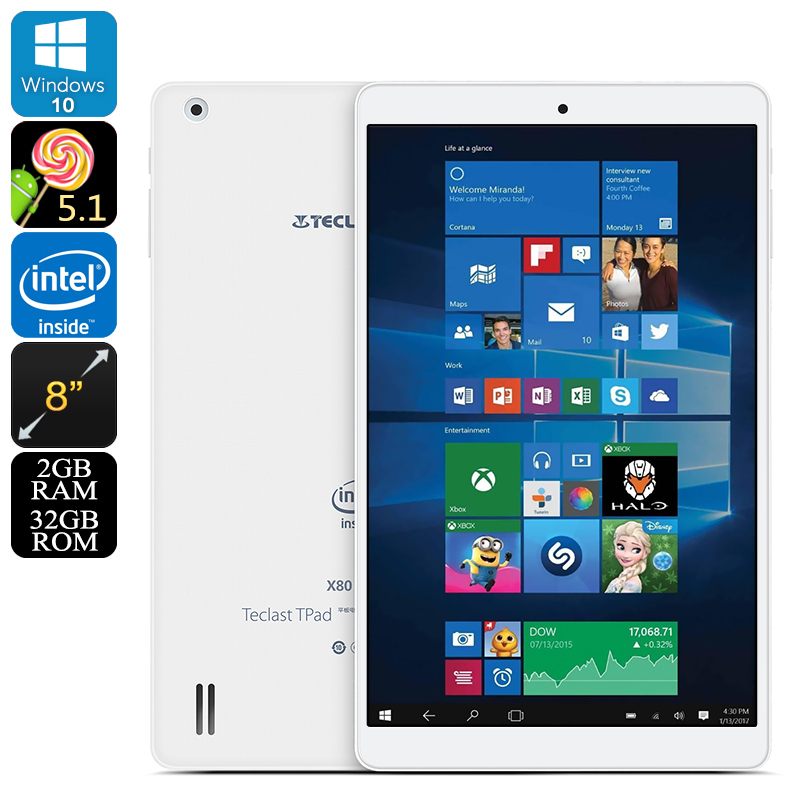 Successfully Added Teclast X80 Pro Dual-OS Tablet PC - Windows 10, Android 5.1, HDMI Out, Google Play, Quad-Core CPU, 2GB RAM, 8-Inch IPS Display to your Shopping Cart. The Teclast X80 Pro is a sophisticated tablet computer that features two operating systems. Coming with both Windows 10 and Android 5.1 installed, this Dual-OS tablet PC provides you an abundance of the latest features. Its Android operating system is perfect for entertainment and mobile applications, while Windows 10 comes packed with the latest office tools – making this 8-Inch tablet PC a truly multifunctional device that is perfect for business, study, and entertainment alike. Featuring a sleek and ultra-thin design, the Teclast X80 Pro can be efficiently carried along no matter where you’re headed – immensely increasing your overall productivity on the go and assuring that you’ll never have to experience a moment of boredom again. Although sleek in size and light in weight, this Dual-OS tablet computer packs some decent hardware. A powerful Quad-Core CPU that has been clocked at 1.84GHz delivers a high-speed performance while its 2GB of RAM lets you engage in excessive multitasking sessions. No matter what you throw at this thin tablet PC, nothing will be able to slow it down. For all the mobile gamers among us, the Teclast X80 Pro furthermore features an 8th generation Intel HD Graphic unit that lets you enjoy breathtaking visuals and graphic effects while enjoying the latest movies and online games. Whether you use it for business, watching a movie, playing the latest games, or simply like to browse the web – this 8-Inch tablet PC is guaranteed to meet all your demands. Coming with 32GB of internal storage and supporting 128GB of external memory, the Teclast X80 Pro packs plenty of space for you to save all your favorite media and files alike. With Google Play installed, this tablet PC provides you with an unlimited pool of mobile entertainment that is available for free – guaranteeing that you’ll never have to be bored again. Featuring a micro HDMI port, this tablet PC does not only let you enjoy all media on its own stunning display but alternatively lets you connect it to your big screen TV. Along with its 3800mAh battery, this Dual-OS tablet lets you enjoy all it has to offer for numerous hours in a row without you needing to worry about running out of juice. Featuring a sophisticated 2MP rear camera and an additional 2MP front snapper, this Dual-OS tablet PC is perfect for taking pictures, recording video, or engaging in high-quality online video calls. No matter where you’ll be headed next, with the Teclast X80 Pro at your side not a single special moment in life will ever again pass by uncaptured. The Teclast X80 Pro comes with a 12 months warranty, brought to you by the leader in electronic devices as well as wholesale electronic gadgets.. The OS versions on this device cannot be upgraded or flashed and any attempts to modify the default OS will void the warranty. As a wholesaler, we provide no software support, advice, or training regarding the operating system and software. Arabic: - 8 بوصة الكمبيوتر اللوحي - Chinese Simplified: - 8 英寸平板电脑 - Czech: - 8palcový Tablet - Danish: - 8-tommer Tablet - Dutch: - 8-inch Tablet - French: - Tablette 8 pouces - German: - 8-Zoll-Tablet - Hebrew: - לוח 8 אינץ - Hindi: - 8-इंच टैबलेट - Italian: - 8-inch Tablet - Japanese: - 8 インチ タブレット - Korean: - 8 인치 태블릿 - Malay: - 8-inch Tablet - Norwegian Bokmål: - 8-tommers tavle - Romanian: - Tableta de 8 inch - Russian: - 8-дюймовый планшет - Spanish: - Tableta de 8 pulgadas - Thai: - แท็บเล็ต 8 นิ้ว - Turkish: - 8-inç Tablet - Vietnamese: - Máy tính bảng 8 inch.